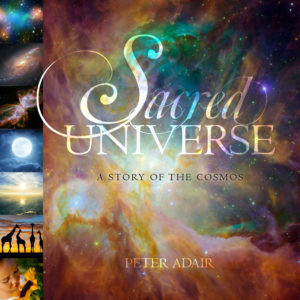 Peter Adair’s 2019 offering Sacred Earth is available at www.adairbooks.com. Please visit us there! My 2018 offering is here! ‘Sacred Universe’ is a 44 page 12 x 12 soft-cover book, a compendium of previous calendar themes. It is beautiful and moving. If you have enjoyed Earth Story calendars in the past, I believe you will find this new format rewarding. Click here to preview portions of the book! “Wow! SO beautiful. I like the simplicity of the book format for the wonderful text and amazing pictures. It’s just really luscious! I wish you could send a copy to every person on earth.” – Nancy W.
“As I poured over the inspiring artwork and simple yet powerful prose, I felt a restored sense of wonder in the awesome nature of the universe…reminding me that all is well with my soul. My mind began to feel unburdened from the everyday stresses and strains of life and opened to these profoundly simple truths: everything is connected, I can relax into being, the innocence of all creation is beautiful, I don’t have to carry the weight of the world on my shoulders, it’s going to be okay. I felt touched personally and for humanity and our planet…touched with compassion, ease, innocence, and truth. I pray that this beautiful message and book spreads far and wide and that many many people experience the essence of their nature as a beloved part of this sacred universe.” – Rev. Mary Francis D.
Buy one book get the second one for only $16! This is a total cost of $36 instead of $40 Use the order form to the left for orders up to 4 promotions (= 8 books). For orders of more than 8 books, use the form below as we are also offering a bulk price for orders of 10 books or more (only $17.50 each!). Order below for any number of calendars. Orders of 10 books or more to the same address will receive the wholesale rate of $17.50* per book! *this price will be reflected in your shopping cart. **At this time, we can only ship to the USA, Canada, Australia, United Kingdom, Ireland, New Zealand, South Africa, and India through the website. If you live in another country, please email Peter at pcadair@sover.net or use our contact form to make arrangements. Note: International orders of 10 or more books qualify for a special flat rate discount shipping cost. Please contact Peter at pcadair@sover.net for pricing before placing your order through the website. Thank you. We invite you to visit our home webpage to learn a little about Peter Adair, the creator of this book, and his wife Caitlin. We would love to host you at our tiny organic B&B in southern Vermont. We are very grateful to Thomas Berry, Brian Thomas Swimme, Mary Evelyn Tucker, John Grim, Michael Dowd and Connie Barlow, and many others for their inspiring and heartfelt work.